I travel a whole lot, and when I do it's good to know that I'm working with an experienced, LGBT friendly company. That's why I wanted to take this time to introduce you all to oh-so-supportive Travelocity Gnome and his Coming Out for 2009! 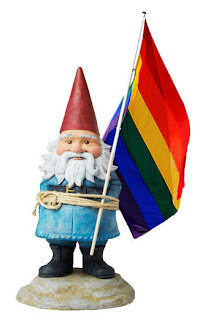 Travelocity has been a strong advocate of the gay & lesbian community for several years now... they simply decided it was time to "step it up" a notch. I couldn't be more excited that my favorite tourism industry mascot is wearing the proud colors of our community. On this blog, and their accompanying Facebook Group, Twitter page and more, I will definitely be following this gnome to stay on top of not only some of the hot, new gay travel packages Travelocity is offering daily, but also the events and adventures of the GLBT Travelocity team as they circle the globe promoting their company and meeting-and-greeting you all in various GLBT travel expos, conferences and conventions around the world.